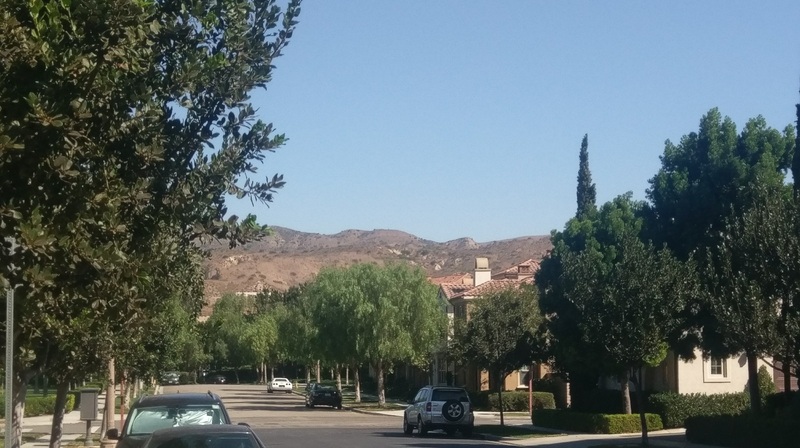 Looking down my street toward the Loma Ridge, part of the foothills of the Santa Ana Mountains. If all you did was look out the window this would qualify as another spectacular SoCal day. The sky is a brilliant blue and cloud free. Take one step out the door and it’s a different story. You’re struck by the heat first, then the lack of humidity. It is windy, making the lack of humidity even more noticeable. It’s noon as I type and we’re around 100°. It doesn’t feel like any hot day I’ve experienced east of the Rockies. This is a totally different animal. It’s dry. Dew points are ~60° lower than the thermometer temperature. Relative humidity is in the low teens. It’s so dry the first thing your body asks is, “What’s going on?” Don’t think of sweating on a day like this. It evaporates as it forms! My potted plants were watered yesterday midday then late night and again this morning. Potted flowers can be desiccated in under a day. That freaked me out when it happened a few years ago. So fast. 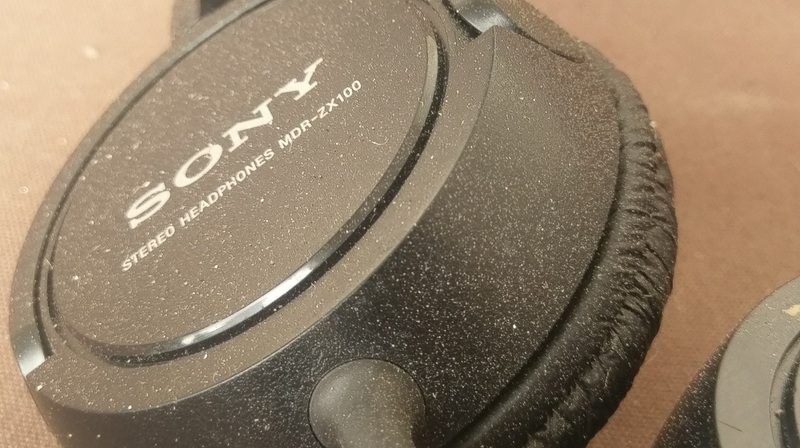 Sandy headphones after a night on the patio. Sandy headphones after a night on the patio. [/caption]Because it’s so dry and winds are out of the east (actually north northeast at the moment) they bring in desert sand. I leave these headphones on the patio. That’s grit just from overnight! It’s on everything. What we’ve got going on are Santa Ana winds. These are downslope winds from our nearby mo.ntains. As they compress they heat up. The effect is so thorough we’re warmer today than the desert areas just to our east! This is fire weather. It won’t take much for one to start and with these atmospheric conditions, spread fast. The are special protocols in place for area fire departments. No blaze is considered small, no call routine, until the winds shift and paradise returns to the Southland. One more day. Things get back to normal Thursday. So frightening to see all of the tv newscasts related to those horrific fires…I’m praying for all of those people who have lost so much..it seems the west coast is doomed between the fires and potential earthquakes..
We are having a lovely rainy day. We needed the rain. However the wind is taking down the leaves before the maples have a chance to turn red.It is a dull fall. All the time. If it was up to me I’d be on your TV every night. If it were up to me, you would, too. If it were really up to me I’d be in California though. We all miss you. I have now switched to Ch.3 for my news and weather. We do not watch them now that you are not on Geoff, Sorry but this is where you belong. My hubby is having going into his 3rd month of chemo for the pancreas tumor and it has gone down in size . He will have maybe 2 more months of chemo and they the Whipple …. I think or you everyday,and pray for the fires to be fought and ended! Take care Geoff California has had enough weather problems it is time to be over! We miss you here in Conn. But hope you will have better weather there in California. Take care! Have a great day! I have a cousin up north in Santa Rosa. She was not affected by that first tragic wave, but was told to evacuate the following day as she is closer to the Nunn fire. She eventually made her way down to San Jose where her son lives and was able to make calls as to her situation. Haven’t heard anything this week, nor have we heard much about the fires, here in CT—I’ll have to check up on her. Did you get any of the smoke from the Anaheim fires? or did the winds take it north. (the smoke). Been seeing the effects of your heat when watching the World Series.